Old Hroldan (also spelled Old H'roldan, Old Hrol'dan, H'roldan, as well as Ahroldan in the language of the dragons) was a settlement in southwestern Skyrim. The Pocket Guide to the Empire, 1st Edition, stated the town was in High Rock. It had been taken over by the Witchmen of High Rock before Tiber Septim famously reclaimed it in the late Second Era at the age of twenty. 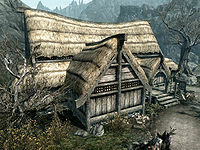 Reclaiming Old Hroldan from the Witchmen, or Reachmen, was something of a pastime, as an ancient property record belonging to the Jarl of Whiterun refers to "H'roldan" as "A Spacious Wooden Hall and Pasturage, recently Seized from the Reachmen. Silver and Iron as Tribute from the Natives." Other records note that in 1E 2801, Emperor Kastav of the Reman Dynasty ordered hostages to be seized from the town to ensure the jarls met conscription quotas. Though formerly a walled and gated city, by the Fourth Era the settlement has been reduced to simply the Old Hroldan Inn, a resting place for travelers in the Reach. The inn, which is wedged between ruins, mountains, and rivers, boasts to its patrons of harboring Tiber Septim the night he arrived. Sightings of ethereal warriors at the inn coinciding with the appearance of the Last Dragonborn gave credence to the inn's claim. For game-specific information, see the Skyrim articles on the Old Hroldan Inn and the associated quest page. This page was last modified on 21 October 2018, at 08:03.